As almost all children with rare lung diseases are also examined bronchoscopically as part of their diagnosis, close cooperation with the working group on bronchology makes sense. The meetings will be held during the annual meeting of the GPP. 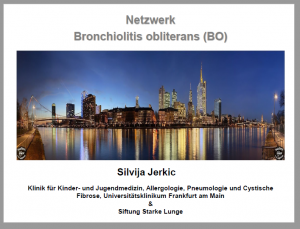 In 2018 dr. Silvija Jerkic gave a talk about the BO network and our latest research miRNA. Establishing of a long-term registry for rare lung diseases in childhood and adolescence, affiliated to the relevant scientific societies. The rare lung diseases in childhood, with the exception of cystic fibrosis, primary ciliary dyskinesia and z. T. alpha-1-antitrypsin deficiency of true “orphan” diseases, e.g. Support groups do not exist. Therefore, registering is a first significant step towards better care and research. As a network, ACHSE helps those affected with rare diseases and drives forward solutions that benefit many people. But most important: ACHSE gives the rare diseases a common voice. Cystic fibrosis Network: research, therapy support, communication. Regardless of their illness, young people want to participate in social life and the world of work. Through stigmatization, they are far behind especially in the path of education and occupation. This organisation wants to help to bring these young patients into work life. The Foundation helps by financing and organizing supervised holiday camps for affected children and therapy-supported holiday stays for the whole family. The Foundation takes also part in research funding. The Foundation helps to provide hope for children with rare diseases – regardless of their background or financial resources. Informations for patients and parents.